You’ve filled your car with the best of the season’s produce. Wanna make something of it? 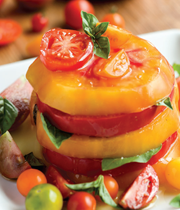 ➤ SALAD: Heirlooms are usually very full-flavored, which permits pairing with whites or reds. A light- to medium-bodied wine works best. Black Mesa Montepulciano 2009 or 2010 A graceful wine of tart cherries and plum notes and smooth tannins. 2009: 50% Deming, 50% Velarde fruit. 2010: 100% Velarde fruit. Casa Rondeña Viognier This popular wine provides melon and apricot notes along with a lush, mouth-filling acidity. ➤ OMELET: The delicacy of eggs and the starches from the vegetables work best with white or sparkling wines. Gruet Brut NV One of their most popular sparklers: crisp, clean, with good acidity and a creamy mousse. Gruet Sauvage Blanc de Blanc NV Robust, with fine mineral notes and traces of green apple, lemon-meringue pie, and a fine acidic bite. Bone dry. ➤ SUNDAE: Fruit-based desserts work well with sparkling wines, but a dessert wine can be even better. Don Quixote Angelica An intense, full- flavored, port-like wine made using a 1628 New Mexico recipe, but with modern winemaking techniques. La Chiripada Late Harvest Riesling 2012 This wine is intensely fruity, reminiscent of apricots, pineapples, and mangos. Seasonal tomatoes, one of the joys of high summer and early fall, need almost nothing for adornment. Here, their jewel tones take center stage in playful stacks. To make the mix heartier, add cubed bacon lardons or crumbled goat cheese. Prepare dressing, first combining vinegar and shallot in medium bowl. Let sit 15 to 30 minutes. Whisk in salt, sugar, and both oils. Slice each tomato larger than a cherry into 3 or 4 rounds. Discard any yellowish core from top center of tomatoes. Transfer slices to individual salad plates and stack them, from larger sizes to smaller, with some of each color in each stack. As you build, moisten surface of each round with a bit of dressing, and add a few grains of salt and pepper. Scatter greens or basil leaves in or around the bottom, if you wish. Cherry-size tomatoes can be halved and tiny tomatoes left whole, to be tucked around edges of plates. Scatter coarse salt and pepper over each plate and serve at room temperature. New Mexico’s beloved calabacitas, a classic sauté of summer squashes with corn and piquant green chile, makes the bright filling for this omelet. Whisk together in medium bowl eggs, milk, and salt until uniformly yellow. Mix in cheese. Warm butter and oil in 10-inch ovenproof skillet over medium heat. Add squash slices and sauté until they begin to soften (about 3 minutes). Add onion and continue cooking until both vegetables are very soft (another 6 to 8 minutes). Add corn and green chile and cook as needed to eliminate liquid from skillet. Pat calabacitas mixture down evenly in skillet. Reduce heat to medium-low. Pour egg mixture over calabacitas mixture and stir gently in skillet. Continue heating until bottom is set (about 3 minutes), lifting edges with spatula and tilting skillet to allow uncooked egg to flow to bottom. Cover and transfer skillet to oven. Bake until set to your liking (12 to 15 minutes). Serve hot or chilled, sliced into wedges. This sauce is somewhat thin, but being uncooked, every bit of the berry flavor still bursts from it. 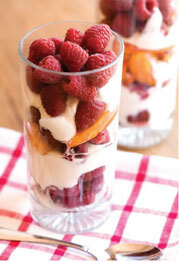 Of course, you can use other New Mexico raspberries for the sauce and sundaes. Softly whipped cream, optionalSet aside 1 dozen plump, pretty raspberries. Purée remaining berries and sugar in blender. Strain through fine sieve. If you wish, stir in Triple Sec. Refrigerate for up to several hours. Scoop large balls of ice cream into parfait or sundae glasses or small bowls. Spoon raspberry sauce generously over ice cream. Top, if you wish, with dollop of whipped cream. Crown each sundae with 2 or 3 reserved berries and serve immediately. Cheryl Alters Jamison is New Mexico Magazine’s contributing culinary editor. Read her blog at nmmagazine.com/tastingnm. Jim Hammond is the author of Wines of Enchantment II: A Guide to Finding and Enjoying the Wines of New Mexico (available at bit.ly/ShopNewMexico). See more of Douglas Merriam’s work at douglasmerriam.com.